Who are the cosmic beings known only as the Psi-Lords? And how will they change the course of the universe in this brand-new ongoing series from Valiant? Four astronauts awake in an otherworldly prison with no memory of how they got there. What is their connection to the Psi-Lords? And how will they escape? Writer Fred Van Lente is crafting a lively sci-fi mystery, and Renato Guedes' art is (literally) out of this world! Dynamic Forces was anxious to get the lowdown on this series, so we spoke to one of our favorite scribes, FVL (with an epic first response from one of main folks behind the Valiant Universe itself!). Hang on and here we go! Dynamic Forces: I have heard rumblings of a Psi-Lords series for years at Valiant. Glad it has finally arrived, but what was the big delay? Robert Meyers (Valiant Senior Editorial Director): No delay, per se; we just had to get all of the pieces in the right place. All of those teases and hints were leading to this moment. We had an idea of what we wanted to do but needed to get the right creators with the best take on the story and the characters. Fred [Van Lente] began working on this last fall, building an entire new world within the Valiant Universe. He and Renato are doing some of their best work. I couldn’t be more excited for Psi-Lords! DF: Thank you, most appreciated. … Now Fred, what can you tell us about the world you and Renato Guedes are building in Psi-Lords? What are some of the cosmic wonders, some of the galactic horrors that serve as backdrop (or foreground) for our new heroes? 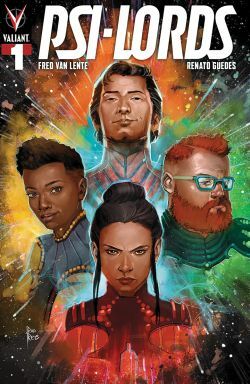 Fred Van Lente: I’ve done a lot of work with the different eras of the Valiant Universe in books like Archer & Armstrong and War Mother – but it’s been very cool to head out into outer space and take part in the great galactic world building Matt Kindt and company have been doing in X-O Manowar. And furthermore, “gods” is a concept we haven’t seen a whole lot of in the Valiant Universe, and the Psi-Lords are immensely powerful psychic beings that aren’t just the most powerful beings in the VU, they may be as old as it. DF: Who are the four amnesiac spacefarers (4 spacefarers? Sounds fantastic! Laughs) who awaken to the strangeness that will be a part of this comic. What challenges face them today, and what horrors await (if you can clue readers in in a non-spoilery manner)? Fred Van Lente: They’re four exceptional individuals, from four walks of life. One is a brilliant scholar, one is a master inventor, one is a decorated soldier, and one is…well, one appears to be an unparalleled assassin, much to her shock and surprise. They find themselves in a prison called the Gyre, with no memory of who they are, how they got there, or how they got their fantastic powers. They only know themselves—and each other—by cryptic call signs: They are Beacon, Artisan, Tank and Hazard, respectively. They’re going to have to figure out how to work together to get out this gigantic prison—so big, in fact, that we have an element of Game of Thrones in the story as well, in that there are all these different factions and races they contend with as enemies and/or allies. DF: Can you tell us more about the Gyre, and what it has to do with X-O Manowar (for those under a rock)? DF: Rock on! … Can you give us an extended elevator pitch, if you will, for what’s upcoming for our motley crew of amnesiacs during the first arc of Psi-Lords? Fred Van Lente: Four exceptional human beings find themselves trapped in an alien “Sargasso of Space,” an orbiting prison around a dying star with no memory of who they are and how they got there—or how they were endowed with godlike ability. Their only clue as to how get out of this “Gyre” and back home is to find the “Psi-Lords,” legendary warlords of vast psychic power. And along the way, they have to contend with the other inmates of the Gyre, their cultures and conspiracies, and conquer them. Or, perhaps, become their champions. DF: Are there any other characters we may need to know about as we jump on board? Fred Van Lente: You may ask yourselves: “Who are the Widowers?” And I won’t tell you. But this series will. DF: Any behind-the-scenes big-bads you can hint at? Fred Van Lente: They may be in the title! DF: Talk about Renato’s art, and what it brings to this cosmic adventure. Fred Van Lente: Renato is really a superstar in waiting, and Psi-Lords will be his breakout book, I predict. He’s really bringing this unique world to life, and challenging me to bring him crazier and more fantastic action set pieces and worlds to create. He has blown beyond my expectations every time. This is why you must buy multiple copies of Psi-Lords #1, because as Renato’s legend grows, our book will only increase exponentially in value! Like pogs. DF: While some of our audience are Googling “pogs,” Fred, what else is brewing on the Van Lente front burner that you can tell readers about? Dynamic Forces would like to thank Fred Van Lente for taking time out of his busy schedule to answer our questions. Psi-Lords #1 from Valiant Entertainment hits stores June 19th! CONAN THE AVENGER #1 SIGNED BY FRED VAN LENTE!